Let It Ride is a relatively new addition in casino games, especially when compared to long-standing casino games like roulette, blackjack, and baccarat. Let It Ride Poker debuted in 1993 and has become a staple in both land-based and online casinos. And while the game is a derivative of poker, you don’t play against other players, nor do you play against the dealer; your only opponent is the house. The game is easy to play and the optimal strategy is easy to learn. The purpose of this site is to introduce you to Let it Ride Poker and encourage you to try it, as well as explaining the proper strategy to maximize your wins and minimize any losses. There’s no need to find a land-based casino. Online gambling sites such as one of the casinos listed in our “short but quality” list of casinos will let you play from home. They also will provide you with a practice account with a thousand in free chips to start with. You play let it ride online right now or keep reading and we’ll give you a quick crash course to explain the best strategy, tips and info on how to play Let It Ride! If you’re familiar with the hands in regular poker, you’ll find Let It Ride is completely intuitive. 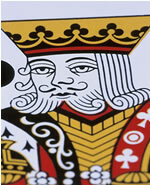 2 additional cards are placed above them face down. The 2 face-down cards are community cards; you’ll use them to make your hand. The goal is to make a pair of 10’s or better. The goal is 10’s or better. That’s what gets you paid. Whenever you have A pair 10’s or better in your hand is a “no brainer”. You are getting paid, now you can just hope to hit even more so you raise your bet every time. Now the excitement comes when you hope to hit an even bigger hand like trips (three of a kind), a full house (three of a kind plus a pair), or quads (four of a kind) as the house turns over the remaining 2 cards! You can see the likelihood of these big hands happening on our let it ride odds page. If you select “Continue,” the first community card is overturned without your having bet anything other than your ante. It doesn’t cost you any more money to see the next card. On the other hand, if you choose “Raise,” you match your ante before the first community card is overturned. Another round of betting follows before the second community card is turned over with the same rules. At that point, the 5 upturned cards make your hand. Winning hands are paid based on the pay table and jackpot tables. That’s the hand in a nutshell, it’s really easy to play and even better the proper Let It Ride strategy is simple to learn. Our favorite place to play Let it ride is at the most excellent Bodog casino. They have a let it ride poker download that is fast and free, and we don’t just say that to be nice. Indeed they offer a great player experience, atmosphere and bonuses, but you also get top game odds, minimizing the house edge compared to some other online casino payouts offered. You can’t go wrong playing let it ride at our recommend online casino. Click here and play now , you’ll get 10% instantly added to your deposit and when you play Let em ride at Bodog, you’ll find that their pay tables and game odds are some of the best online. The house edge in Let Them Ride is dependent on the pay table and the probability of making certain hands, but the one thing that doesn’t change is the odds in let it ride and the hand probabilities. For example, Bodog Casino pays 1,000 to 1 on a Royal Flush (some casinos only pay 250 to 1), 200 to 1 on a Straight Flush, and 50 to 1 on a Four Of A Kind. When combined with the rest of their pay table, the house edge comes to -3.5%. If you bet $20 on all 3 rounds, you can expect to lose an average of $.70 (or, $20 multiplied by -.035) per hand over time. Different pay tables will skew the edge upward. If you’re carrying a pair of 10’s, raise the second bet. This is considered a ‘no brainer’ since you know you are going to win this second bet. The same logic applies; you’re going to at least break even on 10’s. You should also raise if you’re able to make a 4-card flush, 4-card Straight Flush, or a 4-card open-ended straight. If you play that basic strategy, you can expect to post the -3.5% edge using Bodog Casino’s pay table. We’ll go into a bit more detail about advanced Let It Ride strategy elsewhere on the site. What we’ve described above will get you started as will these handy tips for let it ride poker. Some casinos will let you make a bonus bet on your first 3 cards. For example, a 3-card Flush might pay 3 to 1 while a 3-card Mini Royal might pay out 50 to 1. Don’t be tempted. The house edge on this bonus bet practically doubles. You might also have an opportunity to make a side bet (like the bonus bet, not all casinos offer it). In addition to your ante and 2 main bets, you can make a $1 side bet for an extra payoff for specific hands. We’ve seen this one offered in Las Vegas and New York. It’s a bad bet (the edge is huge) and you should avoid it. As we mentioned, our favorite place to play Let Em Ride is Bovada Casino. They offer their entire casino in an ‘instant play’ casino (meaning you don’t have to download any software!). They’re one of the biggest names in online gambling with top-notch around-the-clock customer support. Visitors from LetitRidePoker.org will get a sweet casino bonus of 100% on eight deposits up to $3000. Bovada provides attractive software with fluid, intuitive graphics, but they also let you play Let Them Ride online through your browser. Throughout the rest of this site, you’ll find information about the different let it ride pay tables, odds, and Let It Ride poker strategies that you can use to increase your winnings when you play Let Em Ride. 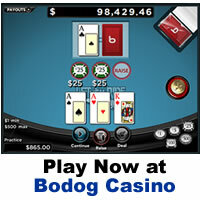 If you have never tried the game, visit Bodog today to get started. The King recommends playing at Bovada casino. They are trustworthy with a well established history of paying their players every time, quality customer support, excellent odds / pay tables on all their games (not only Let em Ride and Tri-Card poker), but they offer a no download casino software with all the games to play right in your browser. Mac friendly and USA players are accepted. Get Eight 100% Match Bonuses – on your first eight deposits, Bovada will match your deposit up to a total of $3000. We really like the Let em ride at Bodog, it’s just like the game above and we are confident you will find Bodog a quality gaming experience. Click the link above to get started, we’ll wager that you’ll be glad you did!